CHW is hiring in our Gainesville, FL, Ocala, FL, and Jacksonville, FL offices! 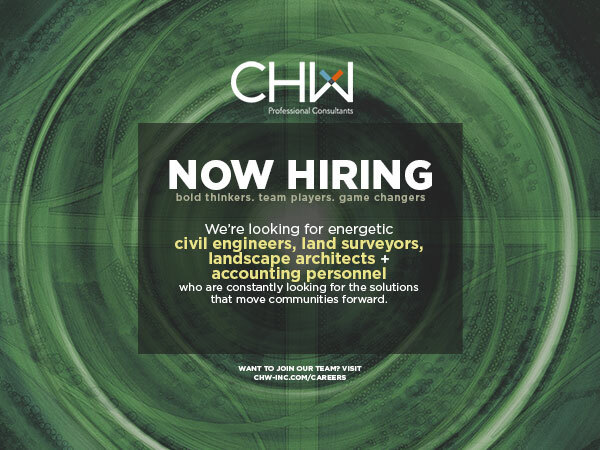 We need civil engineers, land surveyors, landscape architects, and a controller. Bold thinkers, team players, and game changers are all welcome. We’re looking for energetic optimists who want to do more than design, plan, survey, or inspect: we want a team of client advocates who are constantly looking for the solutions that move communities forward. Browse our list of open positions and apply today.